Three weeks ago yesterday, on August 6th, 2016, we held our eleventh tournament in sixteen months. I was posting on the Hawk forum throughout that day, but by the time it was over and we were all faced with packing up four tables and all of our gear, and then the long drive home, I just didn't have it in me to report on Round 3 and the final results. I guess it's like my mother always used to say: "The road to Hell is paved with good intentions." The central building is a bunker and cannot be destroyed! It is still A8 and subject to Falling Masonry, and can be flamed, but it cannot be destroyed. This is the WMD Building. The WMD objective in the central building scores 1 VP at the end of the game if you are holding it, but it scores 3 VPs if it is extracted off of your opponent's board edge by the end of the game, and it is worth 0 VPs if you extract it off of your own board edge. 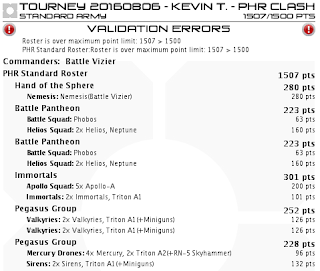 Not to be rude to Kevin and Robert, who both played well all day, and by all accounts had fun, but the outcome of the game on Table 3 in Round 3 was in no way going to impact the Top 3 standings by the end of the round (or so I thought). 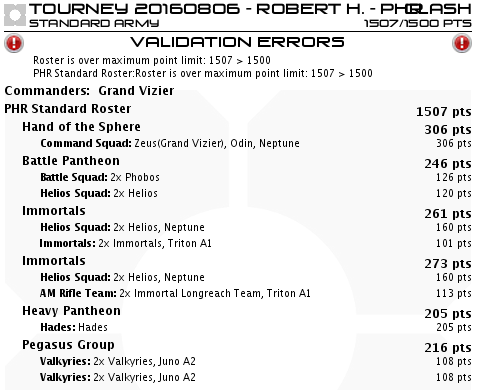 However, one of my customs in running tournaments that we developed back in our grim, dark days of running events is to award Last Place some amount of prize support in the form of store credit, usually as much as Third Place receives, but sometimes we can't go that far; this is a kind of consolation prize, with the goal to give Last Place his entry fee back ($10), if we can afford to do it. 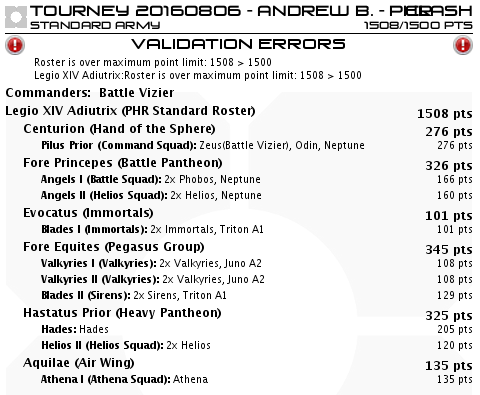 Since we had six players (a decent turnout for us) and the owner of our new venue, Odyssey Games, was very generous in doubling our total entry fees collected to be our store credit prize support pool, I was able to give Last Place the same amount that Third Place would receive, which was $15. I watched Kevin and Robert's game off and on throughout Round 2, but spent most of my time switching between Tables 1 and 2, where the outcome of the event was going to be decided. 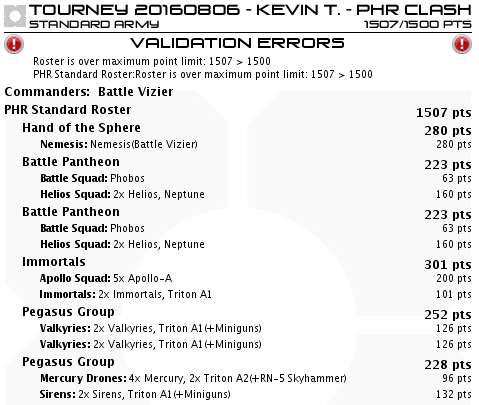 Kevin ended up winning this one by 1 VP, but Robert crushed him on Kill Points, 830 to 261, resulting in an 11-9 win for Kevin. This meant that Robert would end up earning Last Place honors, which in the end wasn't terrible for him. 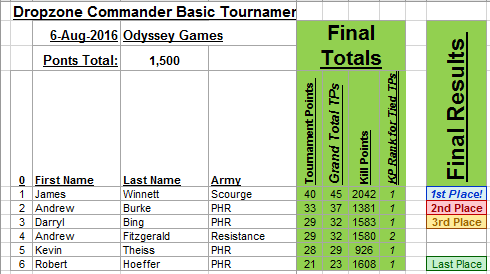 I should also mention that this was Robert's first Dropzone Commander tournament ever, and the first time that Kevin didn't come in at Last Place, so a good result all around for Table 3. Andrew F ("Major Awesome") and Darryl ("DarkNite") were playing on the table that had several freeway overpasses on it, so player edge selection would be crucial in this situation, as Darryl had brought four Thor Bombards. I gather that Major Awesome won the roll off to determine sides/who goes first or second, as he was wisely set up on the side with the majority of the overpasses, which would provide his ground vehicles with some much needed cover from Darryl's Bombards. Early in the game Andrew's two squads of Mehmeds moved up to the right of center and opened up on the tall objective building on the right side of the center line. It only took one turn of shooting by 4 Mehmeds to bring that large structure down, denying both players an objective, but specifically hurting Darryl's chances at earning VPs. Mehmeds certainly are good at what they were designed for! On the left side of this view of the table, in the other tall building along the left of the center line, Darryl had positioned his Menchit A2's around Andrew's side of the building after Andrew had deployed quite a few squads of Fighters and Berserkers to try to grab the objective in that building. Andrew had also moved up his second-in-command Alexander tank so that it was under the overpass to the left of the centermost building, trying to take shots at Darryl's Hyperions which were opposite it. Well, I can tell you, this game showed me the value of Menchit A2's! After one round of shooting their Devastator-2 rockets at the Alex, Andrew quickly moved up a Kraken to put it between the A2's and the nearly destroyed Alexander, saving the Alex in the end. But at the same time, Darryl's Menchit A2's flamed the ever loving crap out of Andrew's Infantry in the tall objective building to the left, so much so that some of them made a mad dash to the central objective building via an Underground Monorail. There was much death and destruction on both sides of this conflict, and regrettably, too much time has passed since then for me to recall all of the spectacular details of this back-and-forth slugfest. Lesson learned for me: Write this stuff down before you forget all the details! 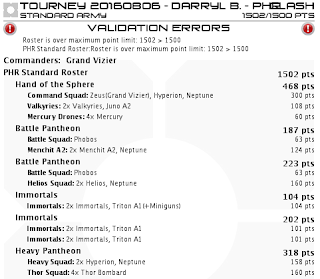 In the end it was a 10-10 draw for these two friends, but frankly, I've never seen Darryl have as much fun playing Dropzone Commander as he did on this day. He was downright giddy! It was a joy to behold. All I can say is, this game was a sight to behold! 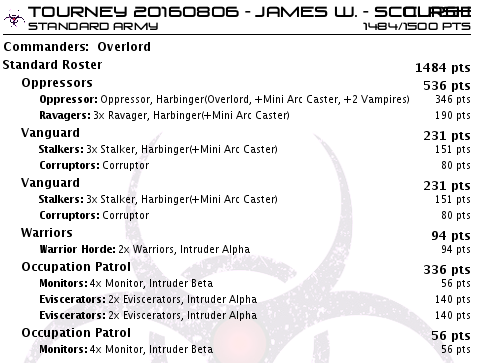 I had played against James' list the night before, and it's tough, especially in an objective-based mission. 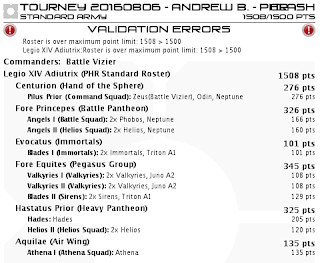 Andrew, while a relative noob, has gotten proficient with his PHR, and unlike Round 1 when it never showed up, his Athena came out of Reserves on Turn 1 this time, and made quite an impact on the game! James, in typical Scourge fashion, got rather aggressive with his forces and pressed them forward, well past the center line. It looked like his Stalkers and Oppressor would have their way with Andrew's ground units. 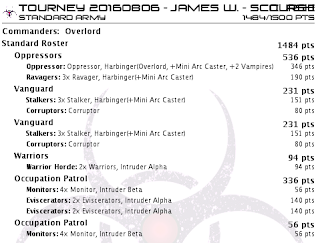 However, someone at White Sphere Labs must have developed a new, highly powerful high explosive compound for use in Stealth Missile warheads, because in the course of just two Turns of shooting, after James' Stalkers had all been deployed (and his Oppressor whiffed vs Andrew's Hades), three Neptunes took out 4 Stalkers with Shaped Charge hits, while the pair of Helios in the center of the table managed to take out a 5th. (The Hades had dispatched the 6th a turn earlier, before it had to turn its attention to the Oppressor that was bearing down on it.) Five Stalkers killed by Shape Charge, in rapid succession! Andrew played a very fine game that Round, and with his back to the wall (and all of his ground forces destroyed before they could fire a shot), James played masterfully to a draw. 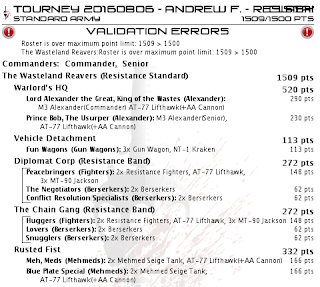 James was clearly the winner, having drawn with Andrew Burke in Round 3. but Darryl and Andrew Fitzgerald, who were tied going into Round 3 on TPs, ended up tied on TPs at the end of the tournament, so it came down to Kill Points. 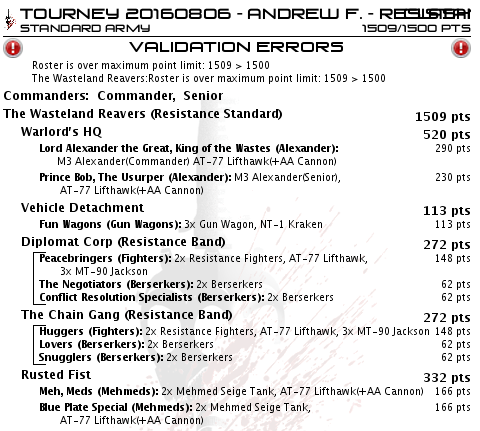 Darryl managed to edge Andrew out of 3rd place by just 3 Kill Points! 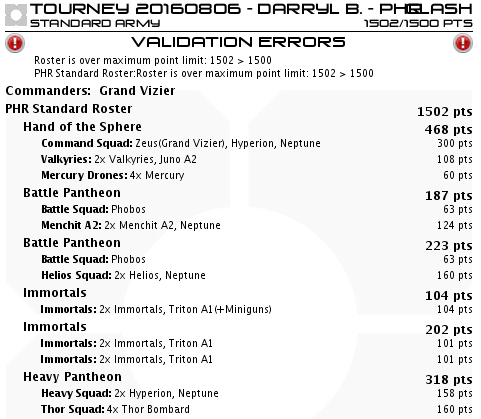 Each of First, Second and Third Places received a show-only PHR Aegaeon medium dropship (we all play PHR, so this was a no-brainer). First Place also got the Blotz Ferris Wheel and his choice of either the civilian buses and semi trucks, or the civilian cars and trucks. (Which of those would be considered "lorries"? ), in addition to $60 in store credit. Second Place got his Aegaeon plus whichever of the civilian vehicle packs that First Place didn't want, plus $30 in store credit. Third place got $15 in store credit in addition to his Aegaeon, and Last Place received $15 in store credit, as previously mentioned. 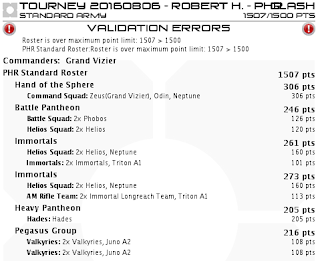 In the end, James passed on his winnings, since he is a Talon, after all, and now (rightly so, I think) feels that he really shouldn't partake of any prize support in an event that he can be, and was, called upon to make rules judgments. I applaud him for this. So, Andrew Burke ended up claiming the First Place prizes, Darryl came away with the Second Place prizes, and Andrew Fitzgerald ended the day "in the money" after all! This was truly one of the best tournaments we've had in a long time, and everyone enjoyed themselves thoroughly! 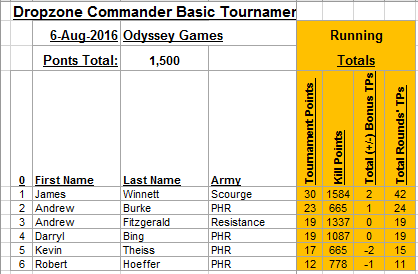 Our next tournament is scheduled for Saturday, September 24th, 2016, at Odyssey Games in Scottsdale, AZ. I hope we can have as good (or better!) of a turnout then as we had at this last one!